Fabulous day at Crafters, jam-packed hall with more than 40 clever crafters! Big thank you to the domestic goddesses who supplied some fantastic looking sustenance, big thanks to the Barista Team, and to everyone that pitched in and tidied up along the way. This month we donated a fully stocked St John Ambulance Hospitality First Aid Kit to the Judbury Community Hall, via the Judbury Progress Association. 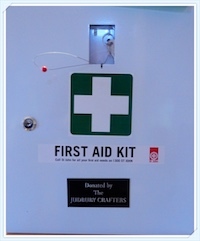 If you have occasion to use the kit, please make a note of that which was used so re-stocking can happen. For $25 plus cost of stock a St John person will drive down and check the kit so we will offer that service each year. Looks like the Buy or Barter table had a good variety of offerings, and the Easter bunny came early with a few eggs. Photos courtesy of Chris Hughson, champion job! 🙂 And also thanking Chris for the Show and Tell. Enjoy the pics, let us know if we need to amend/add/change anything. See you next month, on Monday May 8th. Work in progress by ? Wow – great new hair cut!!!! Wire knitting by Nikki or Josiane?